In the never-ending roller coaster that is the Uncharted movie, Mark Wahlberg has reaffirmed his, Robert De Niro's, and Joe Pesci's association with film. Does anyone know for sure what's happening with the Uncharted movie? Despite reports to the contrary, Mark Wahlberg has once again alluded to his inclusion in the film. Wahlberg seemingly confirmed that he'd be starring as Nathan Drake in the Uncharted movie, but Naughty Dog's Justin Richmond, director on Uncharted 3, denied it was a done deal. In an interview with Moviehole, Wahlberg apparently said he's still going to be in the film, along with Robert De Niro and Joe Pesci. "David O'Russell is writing right now and hopes to direct", Wahlberg said. "It's myself, Joe Pesci and Robert De Niro." 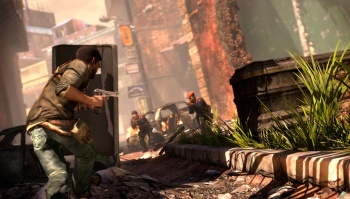 He added that the Uncharted movie will "hopefully" start shooting in the summer of 2011. This may be another blow to fans that hoped to see Firefly's Nathan Fillion star as Drake in the upcoming film. However, Wahlberg's comments are still a bit vague, and with the recent back-and-forth it seems nothing is set in stone until shooting gets underway. The Uncharted film is becoming as cryptic as the myths from the games it's based on.